As Apple Box Studios’ horror flick aficionado, I regret to inform all of you that I have some very sad news. This past weekend, the horror community lost one of its most iconic villains. 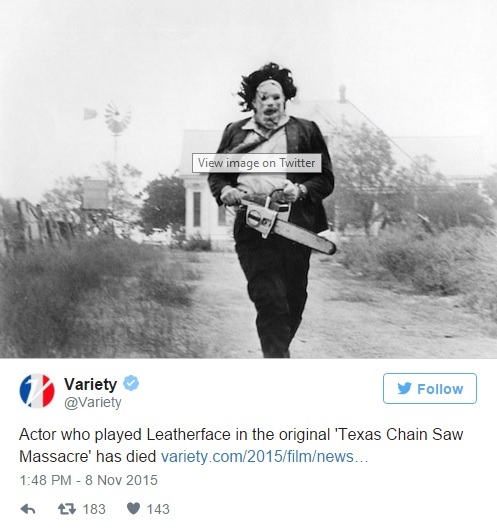 Gunnar Hansen, who played the original leatherface in the 1974 production of the Texas Chainsaw Massacre, tragically passed away at 68 in his Northeast Harbor home in Maine after a battle with pancreatic cancer. Born in Iceland, Hansen was a grad student in Texas when Tobe Hopper approached him to play the role of leatherface, a deranged serial killer wielding a chainsaw based off of the notorious real-life cannibal Ed Gein. The film had a budget of $300,000. Hansen agreed to play the role for just $400, calling it a summer job, never dreaming of the success the cult classic would culminate. In 2013, Hansen published a book entitled “Chainsaw Confidential”. At his time of death, he was working on a film called Death House, to be released next year. He is survived by his partner of 13 years, Betty Tower. On the surface, Hansen’s tragic passing seems to be something that should only concern those in the film and cinema realms. However, after delving into his career, and, more specifically, his time in production for the Texas Chainsaw Massacre, I found we shared many of the same experiences. Although I am not on a movie set everyday or an individual that can fill an entire door frame, I noticed that there were moments in his career that related to my budding career as a young graphic designer. It just goes to show you that you can learn from anyone: even a crazed chainsaw-waving psycho. The production of the Texas Chainsaw Massacre occurred in the middle of the summer in Texas … just think about that for a second. Even if you have never been to Texas in the summer, I’m sure you can imagine what that must be like. Despite the brutal conditions and all of the “wonderful” things that occur when you work on a low-budget film: long hours, last-minute script changes and “sub-par” dialogue, Hansen, along with the rest of the cast and crew, pulled together to make one of the most classic and famous horror movies of all time. The world of professional graphic design isn’t easy, not to mention even finding a professional graphic design job. It’s important to persevere through all of the rejection and pitfalls of following your art vs. delivering for a client. There is a light at the end of the tunnel and eventually the director will yell cut; then, you can and will find your place. 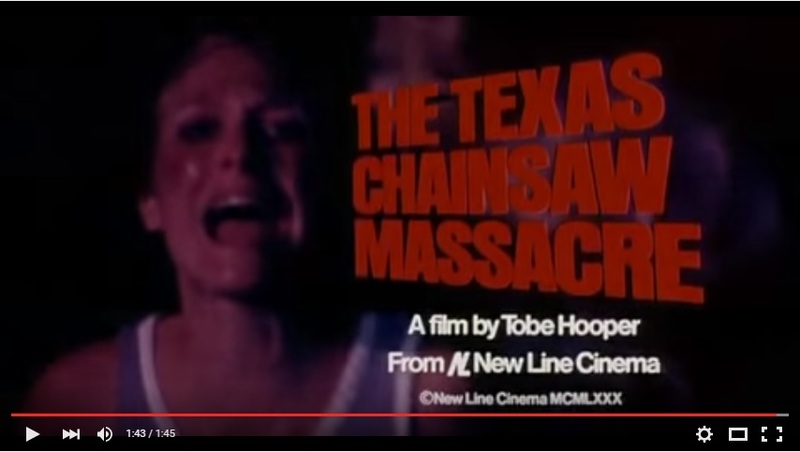 Even though Leatherface did not have much dialogue, Hansen trained very hard for this role. He spent time with pigs (yep, you heard me) to perfect his squeal, visited a school for the developmentally disabled and took up jogging to build up stamina to chase his co-stars around with a chainsaw. Whether you’re an experienced designer about to start working on a new project or just discovering your craft, I can’t over-stress the value of research. I know I was shocked when I read about the amount of research he put into the role, but if he hadn’t, would the role have been as memorable? Before Hansen auditioned for this role, he had just been fired from a bar-tending job and had a fear of public speaking. Obviously, we know how his Cinderella story ended. The only time fear is a bad quality is when you allow it to prevent you from achieving your goals. We can only imagine what Hansen felt when he first sat down with Hooper. I mean, if you’re afraid of public speaking and you’re trying out for a part in a movie … you have to be out-of-your mind afraid. But Hansen didn’t let his fear stop him; and thank goodness he didn’t! This low-budget film had the odds stacked against it from the beginning. And, although it is revered as a classic now, a lot of people did not enjoy it at first. However, Hooper felt that this story needed to be told, and he didn’t allow sweaty, 14-hour days on set and lack of money to get in his way. Hansen, similarly, did not let his fear of public speaking or frustration with the process keep him from seeing his journey through to the end. Everyone involved in this movie took a risk, and, as graphic designers, we need to apply that same mentality as we tackle the world of professional design. It might not come easy at first; the street to success is sometimes paved with potholes. But in order to move forward, risk is necessary. We don’t know where Hansen would be if he hadn’t reached his hand into the unknown and auditioned for this legendary role, but I think horror flick fans would agree: the risk was worth it. Share your thoughts on Facebook!! !